Disc Springs are commonly used to provide deflection under a load in bolted applications. Using a technique called "stacking", two or more disc springs may be combined back-to-back or in a nested configuration. 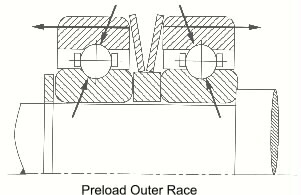 When back-to-back, or in series, the load limit of the two springs remains the same as the load of an individual spring, and the maximum deflection doubles. 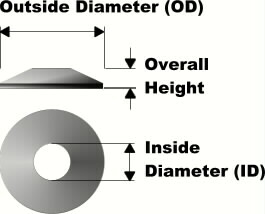 Nesting, or placing the discs in parallel, serves to double the load while the maximum deflection remains the same. Multiple Disc Springs may be combined in series and parallel to provide the exact design deflection and load for almost any application. In a multiple stack, the springs can be flipped from parallel to series or back. The Disc Springs in this series are manufactured in inch dimensions and are available in spring steel 1074 certified to ASTM A684. In addition, certain sizes - denoted with suffix "S" - are available in type 302 stainless steel. Carbon steel Disc Springs are not recommended for applications exceeding 121° C (250°F) and stainless steel Disc Springs are not recommended for applications exceeding 260°C (500°F). Carbon steel Disc Springs are oil finished and stainless steel Disc Springs are passivated. Due to the manufacturing method used to produce Disc Springs listed in this series they are recommended for bolting applications only. Where more precise stack heights and load/deflection characteristics are required series 35 are recommended. The Disc Springs on series 31 are manufactured in metric dimensions to D I N specifications in chrome vanadium steel only and have a black oxide finish. Disc Springs less than 0.9 mm thick are manufactured by stamping or similar process and do not have turned contact surfaces. They are recommended for bolting applications similar to series 30. Disc Springs 0.9 mm thick up to 6 mm have lathe turned contact surfaces at the inner and outer supporting edges. Disc Springs 6 mm thick and greater are machined all over and also include lathe turned contact surfaces as this causes an increase in spring load. The thickness is reduced to compensate for this. This specially designed series of Disc Springs is intended for use with ball bearings and when used between ball bearings will assure perfect positioning of the bearings with no end play. They may also be used to provide precise bearing preload and proper tension extending the life of the bearings and eliminating excessive running noise. This series is appropriate for engineered applications requiring tighter tolerances and loading characteristics than the series 30 provide.